Could 2015 be Herne Bay’s biggest and best ever year? As 2014 comes to a close here in Herne Bay, I thought it would be a good time to reflect on 2014 and mention just some of what we, as a town, can look forward to in 2015. It’s been a great year for Herne Bay, and the community has come together more than over to help put the town on the map. The friends of Herne Bay Clock Tower have formcd following their Heritage Lottery funding success and the Clock Tower is looking fabulous. We’ve seen Herne By Town Partners stage one of the bigget car shows to date and our own summer sci-fi event is now giving some much larger city-based conventions a run for their money. Beach Creative continues to add that all-important art element to the town with their wonderful exhibitions and workshops also. The Carnival Association continues to work tirelessly throughout the year and Hrne Bay In Bloom not only brighten up the town with their colourful planters, but their Picnic In The Park gets bigger and Our own air display in August, despite the weather, brought almost 20,000 people to the town. We’ve managed to stage a scattering of free outdoor and low-cost Kings Hall music events and the Bandstand has been utilised much more this year for free music offerings. Our Halloweek Festival, complete with zombie crawl and ball continues to thrive. The community and local businesses stepped up to ensure Herne Bay had some sparkling Christmas lights and a great event to boot. The town came together to secure the £50,000 People’s Millions funds for the Pier Trust, and we all look forward to seeing improvements to the platform next year. The fun isn’t even finished for 2014 either, we have our own Christmas Ball at The Kings Hallon Saturday and the Pier Trust hold their big Christmas event on Sunday with a land train, reindeer, Santa and lots more for everyone. So what about 2015? Freddie Mercury fans should join us at The Kings Hall on February 7 for Queen II at The Kings Hall. Keep February 14 free in your diaries, as the Friends of The Clock Tower have a real treat for everyone in store following the official unveiling of the refurbished structure and its new hi-tech lighting system. Easter time will see more Easter bunny visits, seafront egg hunts, live music on the plaza, and May Bank Holiday weekends expect more great live music at The Bandstand. 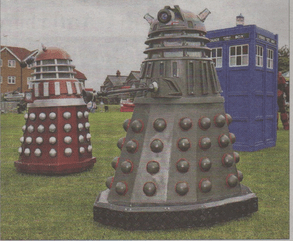 June sees our Sci-fi By the Sea event at Herne Bay Junior School and another giant car show from Herne Bay Town Partners. August looks set to break some records in terms of visitor numbers to the town. We find out in February whether or not our application for the Red Arrows has been successful. If it is, expect the team in red to display across Herne Bay skies for the first time along with a host of other aircraft in what could be the town’s biggest ever event. If the application isn’t successful this time, remember that we’ve still applied for the Typhoon, the Battle Of Britain team including the Lancaster, Spitfire, and Hurricane and other aircraft. One way or another, there’ll be impressive things displayed in the sky next summer. 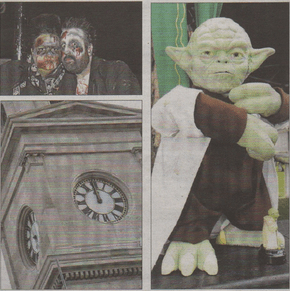 Then we have carnival, festival, Picnic In The Park, Zombie Crawl then another round of Christmas fun for everyone. It’s been mentioned before, but the town does indeed punch well above its weight for its size in terms of things going on, and this might explain why we receive emails from people considering moving to the area based on our lovely seafront, thriving community, independent retail sector and full events calendar. One family from Whitstable messaged us to say they were moving to Herne Bay because there was so much going on, and that there’s only so much one can do with an oyster. ARROW, ARROW, WHO IS HEADING OUR WAY?